Prima Power was an exhibitor at Laser Institute of America’s LME 2018, held March 28-29 at the Renaissance Schaumburg Convention Center, Schaumburg, IL. 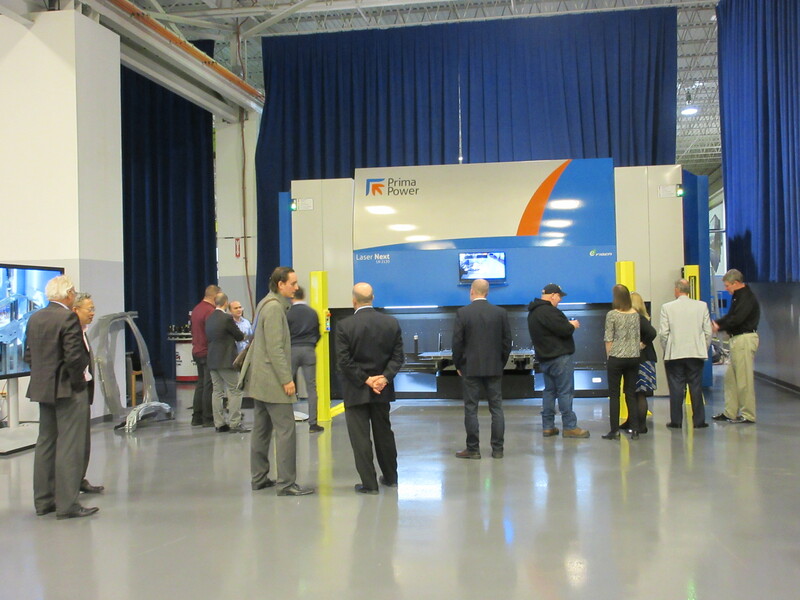 After show hours on March 28, Prima Power hosted an Open House at its showroom in nearby Arlington Heights, IL. A large group of visitors, composed of laser industry experts, suppliers, and prospective customers were able to get a close-up view of the Prima Power Laser Next 3D Laser. Maximizing throughput with a dramatic reduction of cycle times. During the last 10 years, the performance of Prima Power 3D laser machines for automotive applications has been growing steadily. With Laser Next, a fundamental step forward was made: productivity on a typical benchmark component (B-pillar) was raised by 25%. In other words, four Laser Next systems produce as much as five machines of the previous model. Space-efficient layout both for stand-alone and multi-machine configuration. Space is money, and a well-conceived layout helps save square meters and optimizes plant logistics. The compactness of the installation further improves installing more machines, since you can have up to three units one next to the other connected to the same magnetic scrap conveyor, with no need of excavation works. Given the same area, in fact, it is possible to install more machines (e.g. four Laser Next instead of three units of the previous model). Considering the performance of Laser Next, the productivity per square meter ratio is simply astonishing. Improved Overall Equipment Efficiency (OEE). For Laser Next, Prima Power capitalized on its experience of hundreds of installations for the 24/7 manufacturing of high-strength steel components, widely used in car production. Every detail was studied and developed to maximize machine uptime. Maintenance was also lowered and simplified to reduce non-productive times and the need of specialized resources dedicated to these activities. Laser Next has a working range of 3,050 x 1,530 x 612 mm and is equipped with 3 kW or 4 kW high brilliance fiber laser. Its compact focusing head, fully sealed for best protection, features direct drive motors, double protection SIPS, fully-metallic sensor, and Focal Position Control.